Plays / Views: MP3 music, Digital video in MTV format, JPG digital photos and read TXT files. Including FM radio and an Integrated microphone is a nice touch. You can also record from the radio to WAV files. The volume is adjustable in linear steps from a value of 0 to 32 which is a good feature unlike some MP3 players which don’t allow subtle changes in volume. I’m adding the touch screen as a positive because I know lots of other people like them, even though I personally dislike them. I prefer an MP3 player with tactile buttons so I can change volume or skip songs etc with my hand without needing to actually look at the MP3 player. Has an adjustable playback speed option which I haven’t seen before in an MP3 player. Options include: 70%, 80%, 100%, 120% and 130%. This could be a useful feature to use so you can take less time to listen to something you find boring like an MP3 university lecture or training podcast. Unlike most Chinese players the Coby supports Windows Media DRM and can be synched like through media player as well as used for file storage by directly accessing it from Windows Explorer. You can’t hand it around your neck on a lanyard because there’s no lanyard loop or hook. This is a silly design flaw because you have to put it in your pocket where the touch screen can get scratched by your keys, coins etc. The “Random Play” option is hidden under OPTIONS -> REPEAT -> DIR RANDOM. Doesn’t have a bookmark feature, so if you view the main Menu while listening to a song it will stop and you can’t resume the song where you stopped it. The screen is a touch small. 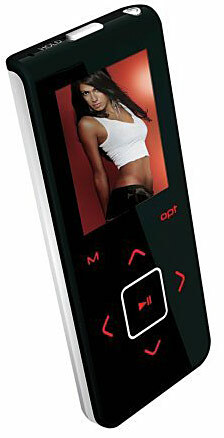 Similar MP3 players have 1.8inch or 2.0inch screens at the same price. I’ve been looking at MP3 players and was debating buying one but the high prices really turned me off. I eventually found a Colby 2Gb MP-C7095 reduced drastically at Canadian Tire for $39.99, a $60 savings on the regular retail price and I couldn’t resist any longer so I bought one. It looks very similar to the Samsung units and the keypad controls are almost the same. The aluminium rear case and black front with red back lighting look great. I spent the evening loading songs and a few pictures. The songs were relatively easy to load with WMP11, but I wasn’t able to get any pictures onto this player. I finally resorted to switching the USB control to treat it as an external hard drive and with Windows Explorer I finally managed to upload a few pictures. There must be a better way. I took the player to the office and thought I’d listen to a few tunes during my lunch break. Wrong…..the unit worked for a while but the suddenly went dead. It would not turn on, would not connect to my computer and was dead. I was really bummed. It’s a nice looking player with a solid feel but it’s all but useless even at the $40 level if it doesn’t work. Looks like I’ll be waiting a bit longer for something economical that actually works. Buyer beware…..you get what you pay for. Well I seen all the bad reviews but took a risk well taken, I received it a few days ago and seem to hold it’s charge well, the screen is a little small but what can you expect for the price, very elegant looking, I put a video but it’s not worth it since the screen is to tiny and hard to watch. I’m assuming that everyone that gave it a one was expecting an ipod quality..lol. But over all I take it to the gym and has not let me down yet. Great little gadget. I bought this a month ago thinking that my kids (10 and 11) may enjoy it for the long car rides (NPR is so boring to them, an actual quote). I actually got two of them. Low to mid priced I also figured I wouldn’t be out of much money if they hated them plus the packaging said video support. Albeit I wasn’t expecting an Ipod BUT if you say video support atleast make the software more intuitive and conversions better. For video playback is grainy and a bit below an “okay” standard. The most annoying part at first is the touch based navigation. Through the years I have used everything from a Rex 6000 (50 points for those who know what this little device is) to a Palm to a IPod. The navigation is NOT intuitive. What you may think is a direct path to one function or another is not. After a couple of days this is easily learned but when trying to play with them at first its a bugger. My kids didn’t like the touch based because it has no tactile feel, to me no big deal but a valid concern for those who need a felt response to know if they pushed the button or not. When trying to learn the device there was hardly any support except a small manual. Software disc didn’t contain any in depth instructions that I had been accustomed to having in electronic devices. It was hard to find the website for other support as well. To me this is the worst part of the device as one may try to do video conversions but has no idea what the limits are or may want to learn more about the directory structure but again has to learn through trial and error. I will say that after three weeks the kids abandoned the devices, maybe it was because the novelty wore off (as so often happens) or their hard time with using it. My wife and I instead adopted both of them after the kids left them laying in the garage. We use them for our walking and workouts and they work just fine. Sure you can buy the little arm band ones but when you have pockets or a stand on a tredmill for water and listening devices it really doesn’t matter (to us). In the car use is fair at best because after a couple of hours of sitting in the hot sun the battery drains rather fast. Sound replication in the car is fine though, as with any MP3 device hooked to a stereo system you have to adjust the two for optimum sound. The final complaint is that you have to recharge it from a computer as it comes without any wall socket to recharge and trying to work around this (by plugging into a powered USB dock station or video game system) doesn’t work. No big deal for those who have computers lying around the house but when the only computer is upstairs in a cluttered office it can be a drag. The Coby 2GB MP3 and Video Player (MP-C7095) currently sells for US$51.66 with free shipping within the USA from Amazon.com or in Australia from Strathfield Car Radios for $69. I believe that its recently been withdrawn from the product range and will soon be replaced by a slightly cheaper new model with a bigger screen. i have had some recent trouble with my 2G mp3 player and cannot seem to understand how to download pictures and movies onto it….. my only request is that someone send me detailed instructions on how to furfill the following tasks. I just opened my COBY MP-C7095, when I saw it I was happy because I think it looks really nice. However, when I finally got all the songs onto it, I realized that the display is kind of cheap, and on mine the M button that is supposed to be for Menu does not work. When I try to use it, it just puts the volume up! Not very efficient, and VERY annoying! But I’m super mad b/c i cant get any PICTURES OR VIDEOS ON IT! Can someone send me instrutions please. I’ve been trying to add pictures and videos for 2 hours. I am finally starting to use this device which Neerav awarded me. i only really want to use it for podcasts and music. But I can’t work out how to make folders. I have all the podcasts and music mixed up in the music section. Can anyone help? My korean friend has this mp3 and video player. I was able to hold and try this player for awhile and the first thing I noticed was that there’s no lanyard hook. His player has many scratches now because he’s just putting it in his pocket. hi i have the same problem i cant download videos in the coby mp3 player i need help and how do u so usb to msc can u plz tell me . can i find the language download? Ive had MANY problems with this MP3. First, I cannot fingure out how to add pictures or videos to their RIGHT places. Second, The sound quality is messed up and sounds faint, and changing the type does not make a difference. And third, Ive stopped using this MP3 for a while, about 2 months, and when i tryed to connect it to the computer and add more songs, IT WOULDNT RECONGIZE IT. Now, i can’t use it at all. I’ve tryed everything: looking up the software, reseting it, download, unistalling it, NOTHING WILL WORK. Please, Any suggestions? …so i’ve had mine for a long time, and i didn’t see anything really wrong with it, but about six months ago the hold button was stuck on lock, so at one point i couldn’t turn it off, and when it died i couldn’t turn it back on. we eventually got it unstuck (i used my teeth), and it worked fine. But a few days ago, the power button got stuck down, and when i unstuck the darn thing it still wouldn’t turn on. Also when you have the thing on lock and r charging it u can’t put music on it, and i tried to do that soooooo many times. So it’s a peice of S***, and I’m getting an Ipod! !